Using Shakespeare’s Macbeth as his jumping off point, Akira Kurosawa’s Throne of Blood (1957) takes a fascinating look at the chaotic swirl of turmoil and treachery that was feudal Japan. The play dealt with notions of civil disorder and battles for power, which Kurosawa transferred from its original 11th century Scotland to medieval Japan. The end result is a powerful masterpiece of cinema. 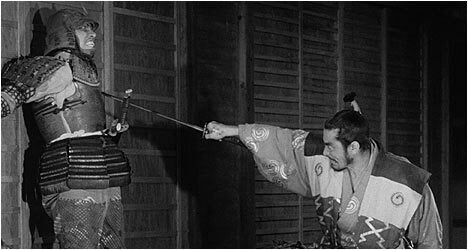 After traveling through the haunted forest surrounding Spider’s Web Castle, great warrior Taketoki Washizu (Mifune) returns from several battles. War is raging between rival clans with betrayal occurring within individual clans as this film illustrates so well. He and his aide Yoshiaki Miki (Chiaki) ride their horses through a seemingly endless foggy countryside in search of the castle. It is like a nightmare that they can’t wake up from. With the help of his cunningly manipulative wife Asaji (Yamada), Washizu murders his way to the top of the clan and goes crazy as a result. Toshiro Mifune delivers another powerhouse performance as Kurosawa’s cinematic alter ego. He delivers one of his trademark energetic performances chock full of physicality. The way he conveys Washizu’s transformation from proud warrior to mad ruler is something to behold. He is matched every step of the way by Isuzu Yamada as his controlling wife. It seems like she has ice in her veins by the way she so calculatedly manipulates those around her to get what she wants. Kurosawa sets a rich, atmospheric tone right from the get-go as the establishing shot is of a fog-enshrouded castle and surrounding countryside. Washizu’s journey through it is like something out of a horror film, complete with the presence of a pile of human bones and a ghost that speaks to the warrior. The brilliance of Throne of Blood is how Kurosawa takes Macbeth and makes it his own, personalizing it so that the play ends up commenting on Japan’s turbulent past. His film takes the sobering stance that the history of violence continues to repeat itself in a never-ending cycle. Ten years ago, Criterion released Throne of Blood on DVD. This new Blu-Ray edition is a huge step up in terms of quality with more layered contrast, more information in the frame, and a sharper picture. There is an audio commentary by Japanese film expert Michael Jeck. He talks about what Kurosawa took and discarded from Macbeth in fascinating detail. He also examines the influence of the Noh Theater (while also explaining what it is). Jeck examines Throne of Blood’s style and themes and how they inform each other on this informative track. “Akira Kurosawa: It’s Wonderful to Create” is a 23-minute documentary about the making of Throne of Blood. It starts off by examining the influence of Noh Theater on the film before diving into production design and other aspects with Kurosawa and his collaborators recounting anecdotes. Finally, there is the trailer.